In our Lazarus demonstration we show you how to use a Timer to repeat a sequence of commands after a set interval. The Enabled property is True so that the motion starts immediately. We set the interval property to 40. The sequence of three lines of code within the Timer1Timer procedure is executed repeatedly but each sequence is separated from the next by an interval of 40 milliseconds. The user can change the interval at runtime using the scrollbar. The ball bounces off each wall and you position the bat using the trackbar so that it will hit the bat. Each time you record a hit, the distance moved by the ball increments. This game might engage you for a minute or two, but you will no doubt quickly think up and develop your own games based on timers. 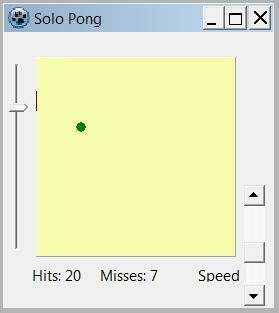 The screenshot shows a game of "Solo Pong". Our code of the files needed for program TimerDemo follows. You can copy the code if necessary, but a you should be able to adapt it for your own use of a timer by looking at the code. Nathan Horsley's Shoot game makes effective use of timers.